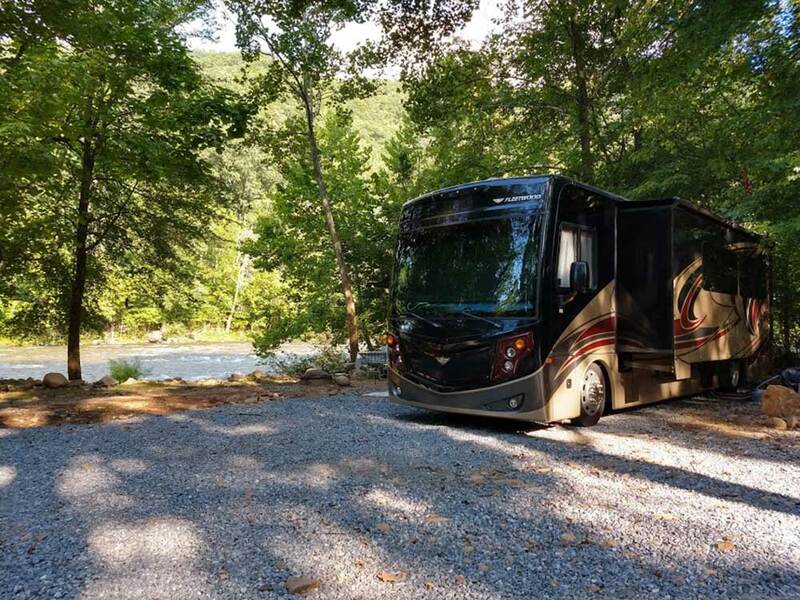 Camp on the Nolichucky River or stay in one of our Caboose Cabins. Come to the national storytelling festivals in October or Bristol's Nascar races in April and August. The park is 5 miles off of I-26 on a 2 lane road and the entrance is not real user friendly. However, the campground is wonderful given the setting on the river and the very clean facilities. The river front sites are the best if you want to clearly get the sound of the river rushing over the rocks. We highly recommend this campground and are considering when we can return to stay again. Almost completely rock - not gravel but sharp, hard, foot slicing jagged rock. So hard to walk on and very very little grass areas. Restaraunt was good. Wonderful management!! Laundry facilities available we're working and clean. Can't get over all the rock tho. I was afraid to put out our mat as it would be ripped to shreds. Must wear solid thick shoes to walk in the campground. Very nice campground. It looked like most, if not all sites were level. Bathhouse was very clean. Staff was very friendly and helpful. The best sites would be the river sites. The rest are pretty close together. It was nice and quiet when we were there. The wifi was ok. Able to get on it most of the time. Would go there again. The campground and campsite was beautiful. The sound of the river was wonderful. There is a lot of hiking areas. The owners are very helpful. We were on site 32. This is a wonderful campground.The campsites are big and there is plenty of room. Bring some inner tubes as the river is so much fun! The owners are wonderful and the diner is delicious! We will be back here.They are also open year round for some fun in the winter also! Words cannot describe how wonderful this place was. The scenery was amazing. The campground, restrooms, and bath house were so clean. People were so friendly, not only the workers but everyone visiting and living there. I hope we get to come back real soon. Fantastic place to relax. Clean bath houses and restrooms. The river is great. Clean, and well kept campground. There is no Wi-Fi. The last time I went they offered it though it didn't work so well. Then again I don't go there to surf the web. I cannot say enough good things about Riverpark. We have camped there several times over the past few years. The Nolichucky River is a major bonus. Bring a kayak, inner tube, or canoe.